After the exalted view of human beings made in the image and likeness of God, today’s readings bring us back down to earth – literally: Genesis 2:4-19; Isaiah 2:11-21; Proverbs 3:1-18. Isaiah continues his attack on the haughtiness of men. Isaiah threatens that God will “terrify the earth.” Thank you, Lord – I feel like saying – thank you, but we don’t need more terror, we have plenty, and most of it is done in the name of some god or other. The cynic in me wants to hit back and say, if God threatens to terrorize and if human beings are made in the image and likeness of God, then no wonder we terrorize each other. This is a problem I have with how Christians view and explain God: We let God off too easily, much more easily than some of the biblical writers, as a matter of fact: Jeremiah, Job, some Psalms. It seems God has little confidence in the humanity that God created; perhaps God forgot that human beings were created in the image and likeness of God. So in the Proverbs reading we are told: “Trust in the Lord with all your heart, and do not rely on your own insight. In all your ways acknowledge him, and he will make straight your paths. Be not wise in your own eyes…” Again, I am confused. Are we made in the image and likeness or not? Why is my insight of no value? This low view of human beings goes back to our Genesis reading – what has been called the second creation story. Except, it’s not the second creation story at all; it is actually the first creation story! Scholars are quite certain, that this alternate creation story came first. The author is usually called the Yahwist because he uses the name YHWH for God. In English translations of the Bible, YHWH is represented by the capitalized LORD. It’s not certain how old this version is, but it’s definitely older than the creation story we read in chapter 1. There is nothing in the Yahwist version about image and likeness. It’s a muddy origin, a lower origin story. And not only that, but a test is set up for man: he is told never to eat from “the tree of the knowledge of good and evil.” And the threat is death: “in the day that you eat of it you shall die.” Much ink has been spilled over the millennia speculating on this commandment and what the forbidden tree meant. I’m not going to add any speculation of my own. Let’s just see it in the simplest and most direct way: it was a test of obedience. Obedience: a messy concept. Most of us resist it; we don’t like to obey orders, regardless who gives them. So did God set up humanity for failure from the start? It’s a pointless question. It’s a myth, created by the Yahwist. Whatever psychological or archetypal reality underpins the story, it doesn’t cease to be a story, a parable. It’s funny, but myths more often than not are more real than actuality reports. Most Christians are scared of the word “myth” because it brings up the idea of something false. But what really is a myth? It’s an archetypal parable. A parable reveals aspects of human experience we can relate to. Myth is parable stretched to cosmic, primeval dimensions. That’s all, nothing to be scared of. Our lives are built on myths and are enhanced by myths. Science itself creates myths to promote its discoveries and intuitions. My first encounter with the myths of the Bible will remain firmly in my mind forever. It occurred in my first year of seminary, in my first class with our professor of Old Testament, Fr. Paul Tarazi. In his introductory class he indeed began speaking of “myth” in connection with the first books of the Bible. I actually rebelled and raised my hand in protest. I remember quoting some text from the New Testament – probably 2 Peter 1:16, or maybe something from the Epistle to the Hebrews, I can’t remember for sure – to challenge what I was hearing him say. Today I continue to be in awe of the magnificent vistas of biblical meaning that Fr. Tarazi revealed to me those many years ago. 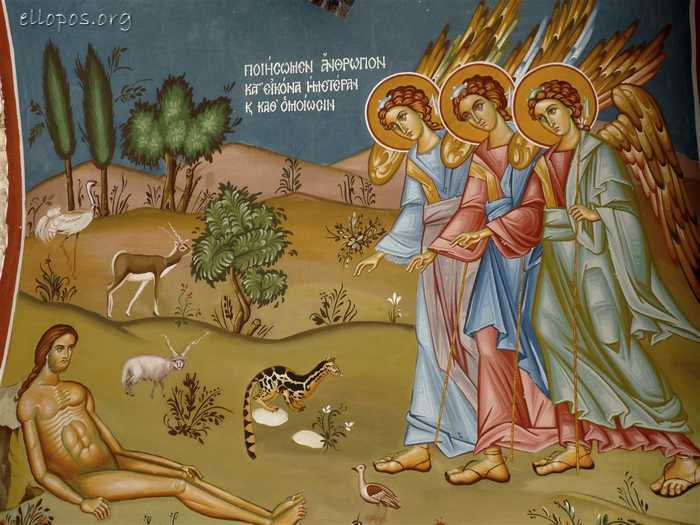 Orthodox iconography is not afraid to use mythological imagery in representing the creation of man. Note in particular how Jesus is present in physical form at the creation! Beautiful theology, profound truth, but not exactly a “selfie” taken with God’s smartphone! In fact, I venture to say that Orthodox iconography is much closer to the spirit of the biblical writers than any literalist or fundamentalist reading of the Bible – or most scholarly readings for that matter! 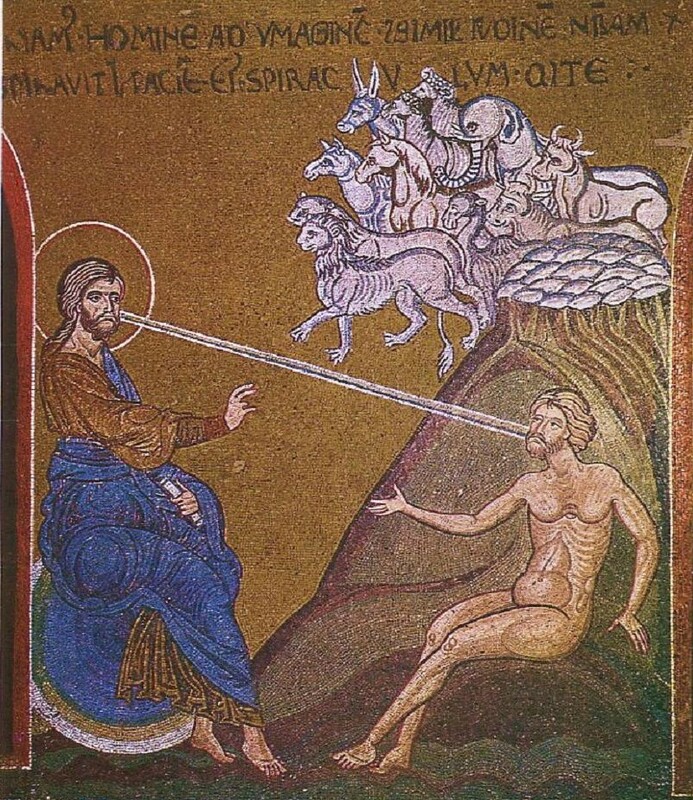 And here is a very unusual image to represent the creation of man in the “image and likeness” of God. God is represented as a trinity of angels – an echo of Genesis 18, but also to represent the plural “Let us make man in our image…” in Genesis 1:26. Did God create man by shaping a mound of earth and then actually breathe into his nostrils to give him life? Of course not. But is man from the earth, connected to the earth, and does man return to the earth? We know this is so. Is human “life” meant for intimate union with God? This also we believe, and that is what is meant by God breathing into the nostrils of man. The mythical language of the Yahwist’s “second creation story” is less exalted than the “image and likeness” language of the first chapter of Genesis – but it accurately describes our connection to the earth and our intimacy with God and the earth. As for the obedience requirement, we’ll leave that for another day. Categories: Lenten Reflections | Tags: creation of man, myth, obedience, Orthodox iconography, Yahwist | Permalink.